I know personally of at least 2 cases, one of them being that of an old friend based in the U.S. and the other, that of an erstwhile professional associate from S.E. Asia, who couldn't exchange their currencies for Indian rupees after landing at one of the major Indian airports. Luckily, in both cases, local relatives & associates who had gone down to the airport to meet them and pick them up managed to bail them out for the time being. I wonder what business visitors & tourists, who have no such backups available, must be doing. I can imagine the panic, consternation and the word-of-mouth tales that must be spreading like wildfire about the travails of changing currencies in India, post the demonization of 86% of the cash on 8/11. I read a report that RBI & the Min. of Finance, India have issued 25 different instructions, piecemeal, several of them being U-turns on earlier instructions communicated to the banks, in the 15 days since 8/11. Forget the customers, even the bank managers are totally befuddled by this spate of instructions and regulation changes, virtually on a daily basis. Does the Indian banking system and, more importantly, India's central bank, the RBI, have any credibility left after this roller-coaster ride that they have been putting their customers through, during these 15 days? Who is going to trust them and have faith in their regulations & policies internationally, hereafter? And, talking of automation and electronic transactions, I wonder how their software systems & apps are coping with these rule changes & U-turns on a daily basis? Well I know the answer to that one. They simply aren't and are now facing a situation which is borderline disastrous. 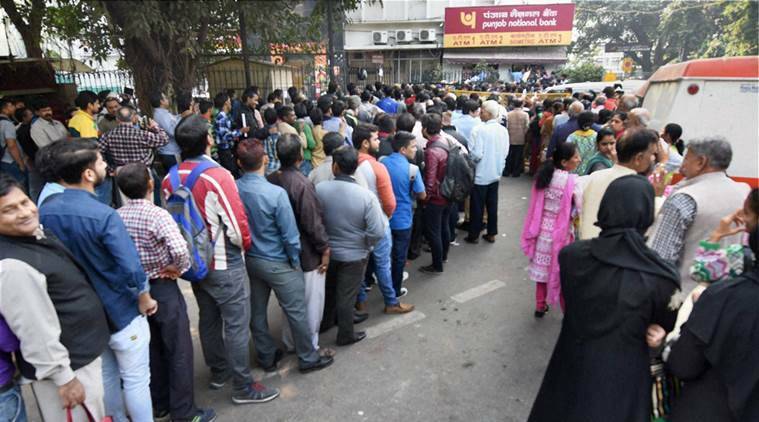 Meanwhile, even though long queues may not always be visible outside banks in urban centres, reliable internal sources tell me that cash-out situations, both for branches & ATMs, at times stretching over more than one day, continue to be the norm for most branches & ATMs in most Indian cities. Rs. 100 notes, sent out initially, are now facing an acute shortage and are not being dispensed by banks & ATMs any longer. People are hoarding these like precious objects which they have suddenly become. Owing to the shortage, banks are forcing customers to accept soiled and, at times, even torn Rs. 100 and Rs. 50 notes. Rs. 2000 notes being dispensed aplenty now have hardly any takers so ATMs stocked up only with these are as good as useless, as customers willing to get only these happen to be few and far between. One shudders to think of the situation prevailing in rural branches. While standing in queues for hours, villagers are being bombarded with the propaganda of being frontline soldiers in the war against black money. Folks who have no idea of what apps may be and have never ever handled a smartphone are being told about the virtues of digital wallets and cashless transactions. Solzhenitsyn's Gulag Archipelago is experiencing a revival, circa 2016, in India. Economists & financial analysts can continue to compute the GDP loss on a daily basis and the projected GDP contraction on an annualised basis as a result of these prevailing conditions and the hit that farming, transportation, retail and daily wagers, among others, are experiencing as a result of these prevailing conditions but the fact remains that India's banking & financial system has been badly hobbled and its credibility has all but evaporated internationally. Banking and carrying out financial transactions have become a surreally nightmarish experience for teeming millions across the length and breadth of India. Finally, the fact that people can't withdraw their own money from their accounts in banks, except in dribs & drabs, raises serious questions about the health of the Indian banking system and its continued viability, internationally. Suddenly Indian banking & financial systems are beginning to look like those in Ethiopia & Libya.